Motorcycling can require technical protective equipment. 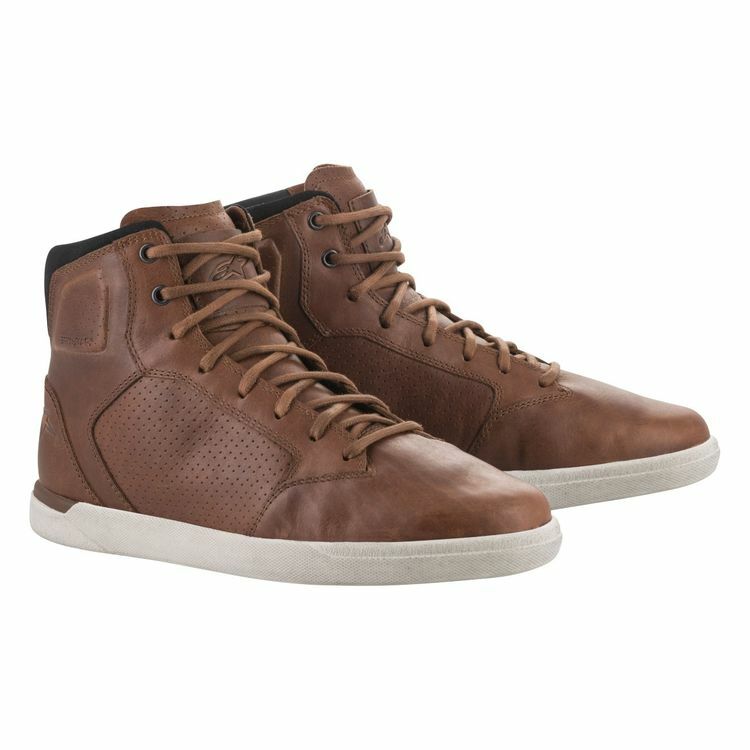 The Alpinestars J-Cult Drystar Shoes provide basic technical motorcycle protection for your feet while still looking like a casual set of full grain leather sneaks. An Alpinestars Drystar membrane provides breathable waterproofing so your feet stay dry during the unforeseen rain shower on your commute. Dual density ankle protectors provide medial and lateral malleolus protection. A subtle heat pressed Alpinestars logo is the only clue your shoes were made with motorcycling in mind. I wear a 13 in everything and ordered a 13. Length is great, the shoe is slightly narrow. Not a problem for fit, but it makes the laces end up being a little short since the middle is wider apart than when you get them out of the box. Laces look super sharp but I hate how they feel. Tough to pull and tighten and don't feel too sturdy. Replace the laces and they're really pretty good. Obviously not as protective as a full boot but they feel good. Feel through the sole is decent without being overly thin. I bought as sort of a fashionable shoe that I could still feel ok riding in, and they're good for that. All in all a decent shoe. Leather is nice, but I treated it for waterproofing, as the shoe's waterproof membrane sits below the leather and it'll go bad. I use Chamberlain #3 leather milk to add water resistance. The leather otherwise is very nice, full grain. Bad stuff: the laces. They're short and they break fast. They're around 60 or 62 inch, but I bought 72 inch Danner laces to make sure I can use all holes and have room to actually tie them. Also annoying: no additional toe shifter pad. Narrow fit, no half sizes. I wear 10.5 D in dress shoes, has to go to size 11.